Alec White is one of those amazingly generous people who took the suggestion “open your cellar, open your heart,” well, to heart. He sent three different bottles. 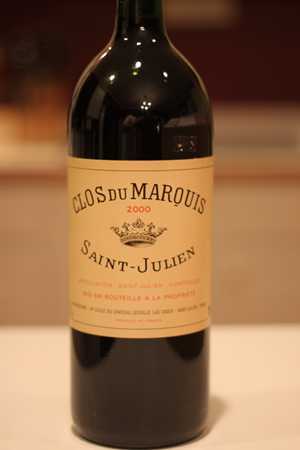 This is the third, a magnum of the 2000 Clos du Marquis. Retail value is $150.00. “The nose shows loads of plum, spice and meat aromas, as well as hints of licorice. It’s full-bodied, with firm, yet velvety textured tannins. It’s big and rounded. If you can’t afford Las Cases, try some of this. Some might call this a second wine, but it comes from a plot of vineyards not deemed worthy of Léoville Las Cases. So it’s like its own estate. Best after 2009.” 94 Points. Wine Spectator. “One of the great sleepers of the vintage and probably the best Clos de Marquis I have ever tasted, this wine could easily compete with many of the vintage’s classified growths. Dense, opaque purple-colored, with creme de cassis, vanilla, and cherry notes, medium to full body, an unctuous texture, low acidity, and a more evolved style than its bigger sibling, Leoville Las Cases, this dense, chewy, remarkably concentrated and stylish wine should be at its best between 2005 and 2018.” 91 Points. Robert Parker Jr. Opening bid is $80.00. Minimum bid increment $10.00.